Inter-University Consortium for Political and Social Research (ICPSR) is an international consortium of more than 750 academic institutions and research organizations. It provides leadership and training in data access, curation and methods of analysis for the social science research community. ICPSR maintains a data archive of more than 250,000 files of research in the social and behavioral sciences. It hosts 21 specialized collections of data in education, political and social behavior, aging, criminal justice, substance abuse, history, terrorism, economics and other fields. ICPSR collaborates with a number of funders including U.S. statistical agencies and foundations, to create archives organized around specific topics. Thematic collections and the new services created for them bring a dynamism to ICPSR from which the broader social science research community benefits. The funders provide new data, in most cases free to everyone, and this stimulates more research. The funded archives and ICPSR collaborate to build additional infrastructure for effective data use and discovery. The moment a fire breaks out, a hurricane makes landfall, a tornado touches down, or a trickle turns to a flood, the clock starts on response, recovery and mitigation of the current disaster as well as planning for future events. At the L. Douglas Wilder School of Government and Public Policy, each discipline has a role to play in disaster management and mitigation. Emergency preparedness plays an important port in mitigating the effects of any disaster. Immediate response teams are set up using the principles of incident management command. Start with the Homeland Security and Emergency Preparedness guide that will lead you to these library databases to study after action reports: Homeland Security Digital Library , Web of Science, and Academic Search Complete. In the first hour(s), maintenance of order and law enforcement become vital as regular legal structures may fail. Additionally, infrastructure complications can arise from failed power or incompatibility among first responders. To study the criminal justice aspects and police and other legal responses, the Criminal Justice Research Guide organizes databases such as Criminal Justice Abstracts , PsychINFO, and WestLawNext. Best databases to study failures in communications include Web of Science and Communications and Mass Media Complete. Beyond the first responses, nonprofits play critical roles in immediate disaster relief and ongoing support. This often creates a sense of urgency to donate, however, it is important to note that not all nonprofit organizations are the same and some might operate in a less than ethical way. Nonprofits are not held to the same guidelines as publicly held companies; their tax exempt status is regulated by the federal government’s Internal Revenue Service under IRS Exempt Organizations, so there are some reporting requirements. This information is intended to help people make good donation choices, but it can also be used for research purposes. The Nonprofit Research Guide provides numerous resources for researching nonprofit organizations. These include Charity Navigator, Guidestar and Center on Philanthropy as well as Public Administration Abstracts and Social Services Abstracts. From the disaster’s first day and well beyond. Issues related to public policy and administration factor in. Public policy, as set by local officials, will determine the speed of normalization as recovery progresses. Studying the best practices in returning children to school, normalizing the traffic flows, and making government function outside disaster mode can improve the response in the future. The Public Administration Research Guide is a good place to start. Databases for studying these public policy effects including ABI/INFORM, Business Source Complete and Public Administration Abstracts. Disasters also raise issues about Urban and Regional Studies. Disasters expose the weaknesses of populated infrastructures. Although the costs of catastrophes are often measured in loss of life or property, the impacts go far beyond that in terms of restoring an area to its former state. Urban and Regional Planning research about disasters can be found in the Urban Planning Research Guide and in these databases: Urban Studies Abstracts, Index to Current Urban Documents and Access World News. Merck Index Online is an authoritative source of information on chemicals, drugs and biologicals. You an search or browse its more than 11,000 monographs (chemical compounds) that can be explored for research and everyday practical purposes. Ideal for quick searches to reveal the properties of compounds and biologicals, Merck Index Online provides identifiers such as CAS Registry Number and structure. It also gives the molecular formula, molecular weight and melting point as well as Trademark names. Structure search is simplified by the ‘convert’ feature, which allows for inserting a compound name and then converting it to a structure to enable a substructure or exact structure search. It has more than 500 organic named reactions (ONR) which have been recognized and referred to by name within the chemistry community, for example, the Ehrlich-Sachs Reaction (1899). Attached to each ONR are relevant references including that of the original description. All references are from scholarly journals, encyclopedias and handbooks. Apart from properties, all records have appropriate sections that describe them, depending on the type of compound. One example is the “Therapeutic Category” under Classifications, which is useful for identifying uses of compounds and their derivatives in healing, re: Glybuzole – Trademark name – Gludiase as an antidiabetic. The database is further enhanced by its 28 reference tables. Merck Index Online is valuable to researchers, faculty and students in basic science, chemistry, pharmacy, chemical and life science engineering, biomedical sciences, dentistry, allied health, and medicine. It is also useful for everyday practical purposes such as information on additives or components, nutrients, minerals, and proteins. For example, get all the information for the cooking spice, nutmeg, its uses in flavoring food and beverages, nutmeg oil as a fragrance in soaps, detergents, creams, lotions, perfumes, and candles. IBISWorld Procurement Research Reports provides valuable insight and analysis on almost 1,000 goods and services purchased by businesses every day. IBISWorld’s Procurement research was specifically designed to help purchasing, supply chain management and strategic sourcing students, faculty and researchers to identify price drivers and market characteristics that impact buying decisions. IBISWorld reports are designed to quickly and effectively answer the questions that arise while sourcing new and existing products and services. Business students and faculty as well as entrepreneurs and consultants use the reports to enhance early-stage consultations with internal departments and execute thoroughly researched purchasing decisions. Did you know that the Uniworld database is useful for budding entrepreneurs and locating details on business competitors, career opportunities and foreign internships? This database covers multinational companies with headquarters in over 200 countries and 20,000 industries. Uniworld is a basic and effective resource for locating company information. The power of this database can be found in the combination of keyword searching and the following 13 search filters: company parent, subsidiary or division name, product description, headquarters country, subsidiaries country, public, private, companies with career postings, zip code, industry code, revenue and employees. VCU Libraries is offering a trial of the new GuideStar Pro Library Services. GuideStar’s current free program is being revamped and soon will not be available for free after the fall. In its place will be a new commercial version, GuideStar Library Services (Pro). This advanced level of data will allow VCU researchers the ability to access to the world’s largest source of information on nonprofit organizations featuring information on more than two million nonprofits, along with numerous filters to refine extensive search results. The trial of this new Guidestar product runs from Aug. 28, 2017 through Sept. 30, 2017. You can access the site via www.guidestar.org. Based on the results of the trial and feedback, it will be determined if the library will proceed with the annual subscription. Send your feedback to Pattie Sobczak. If you have any questions, please contact Pattie Sobczak at psobczak@vcu.edu. VCU Libraries will discontinue its subscription to the RefWorks citation management tool as of August 31, 2018. Librarians will be happy to assist faculty with moving references and learning the capabilities of other citation managers such as Mendeley, Zotero, and EndNote. RefWorks users can continue to use RefWorks for the current academic year, and make the transition at a time that is convenient. If you plan to transition from RefWorks to Mendeley or use Mendeley already, VCU Libraries has a substantial number of free premium upgrades available to faculty on a first come, first served basis. Contact us to request an upgrade, to learn more or to request instruction for your students. Along with helping you keep track of the articles you’re reading, reference management software can auto-generate citations and bibliographies and make it easy to share resources with collaborators and students. VCU Libraries offers support for two of the most popular reference managers, Mendeley and Zotero. Using browser extensions, these tools can quickly save reference information from PubMed, Web of Science, IEEE Xplore Digital Library, Google Scholar and other online databases. Or metadata can be retrieved from imported PDFs. Group libraries allow users to share the full text and associated notes. When writing, both Mendeley and Zotero interact with Word to automatically generate in-text citations and bibliographies. For those using LaTeX, both can generate a BibTeX file. Base accounts with both these tools are free and VCU Libraries has 500 free Mendeley upgrades available to faculty upon request. VCU now offers unlimited access to Anatomy.TV, which features comprehensive and interactive 3D models of the human body. This digital medical resource provides more than 6,500 anatomical structures, clinical slides, dissections, illustrations and animations that span every region of the body. The models are developed using real scan data providing medically accurate representations. The interactive human body is separated into nine regions that are fully explorable from simple structures in the head and neck area to the complexity of gross motor functions. VCU’s Anatomy.TV subscription gives users access to three interactive modules: 3D Atlas, 3D Real-time and Functional Anatomy. 3D Atlas presents a foundational learning experience, allowing users to select specific structures or systems. It provides interactive 3D views that can be layered, MRI scans, anatomical illustrations and movies. 3D Atlas operates like an interactive textbook, providing a guided look at the human anatomy. 3D Real-time provides the same content as 3D Atlas, but offers a greater customizable and interactive experience. Users can fully explore 3D anatomical structures with an enhanced ability to rotate, zoom and layer. Structures can be made opaque or translucent and may be viewed in isolation or within its greater system. 3D Real-time also supports annotation and pin creation, audio pronunciations, drawing and labeling, and a stereoscopic 3D effect for viewing with 3D glasses. Functional Anatomy includes a 3D anatomy atlas of over 290 interactive views, more than 75 muscle function animations and over 80 surface anatomy movies for real-life context. This module focuses on the musculoskeletal systems and their movements. Anatomy.TV is indexed and exportable allowing for integration into presentations, slides and other study materials. Interactive quizzes and tutorial videos are also available to users. In 1946, following the chaos and horror of World War II and concerned by what they saw as the American education system’s failure, Algernon D. Black, a leader of the New York Society for Ethical Culture, and Alice Kohn Pollitzer, a prominent civic leader, began an experiment in democratic living. Inspired in part by the Civilian Conservation Corps and other work camps, the Encampment for Citizenship was a non-profit, non-partisan, non-sectarian summer residential camp for students. Working with members of the American Ethical Union, Black and Pollitzer sought to create a life-changing experience. The student body would be racially, geographically and economically diverse. The educational program would be both intellectual and experiential. The Encampment was founded on principles that had long been held and practiced by the AEU: a firm belief in the value and efficacy of education and the notion that one’s principles must be manifest in action. Education was seen as the first step toward solving many of the world’s most difficult problems. During the 50 years following the Encampment’s inception more than 7,000 young people participated in annual summer sessions, year-round leadership training programs and various short-term projects in locations across the United States and Puerto Rico. Some notable alumni include: Gale Brewer, Ada Deer, Joseph O. Prewitt Diaz, Barney Frank, William Haddad, David Harris, Allard Lowenstein, Jean McGuire, Eleanor Holmes Norton, Charles Patterson, Miles S. Rapoport, David Rothenberg, Hal Sieber and Floyd “Red Crow” Westerman. The Encampment for Citizenship collection is held in Special Collections and Archives, James Branch Cabell Library. Materials include Encampment publications, program and recruitment brochures, correspondence and memoranda of staff and board members, letters and correspondence of students and alumni, alumni and staff directories, alumni newsletters and reunion materials, yearbooks, newspaper and magazine articles, fundraising and sponsorship materials, student and staff evaluation questionnaires, workshop materials, photographs and slides. The bulk of the materials date from 1946 to 1997, with concentrations in the collection’s holdings dating from the late 1970s to the early 1980s and from the late 1980s to the mid-1990s. In 2016, as the Encampment marked its 70th anniversary, VCU Libraries presented materials from the Encampment Collection in its online gallery. It is the library’s hope that these photographs, documents and student publications serve as a digital scrapbook, revealing not only the organization’s history, but also some of its spirit. VCU Libraries has secured a free trial of Trip Pro database. This free trial will last through July 21.To help VCU Libraries determine whether or not we should subscribe to the Pro version of Trip, please send your feedback to gaukh@vcu.edu. The Trip Database is designed to find answers to clinical questions using the best available evidence. TripPro offers these enhancements compared to the free version. Communal effort creates access to rare ms.
One of the emerging and expanding roles of libraries is the creation of scholarship. This work, which adds to the ongoing role of libraries to provide protection, perservation and access to scholarship, is explored in a transcribathon in partnership with the respected Folger Shakespeare Library.In 2015 and 2017, VCU Libraries bought some 100 members of the VCU and RVA communities into James Branch Cabell Library to work on transcribing 17th-century manuscripts handwritten in early modern English. Photos from to April 7, 2017 session. These hands-on digital humanities projects involved students, teaching faculty and staff, librarians, community members and scholars from the Folger Shakespeare Library in Washington. Co-sponsoring with the VCU Department of English, the VCU Humanities Research Center and the Folger, VCU Libraries showcased its commitment to collaborative learning through digital creation. Transcribathons – developed by the Folger – are held nationwide. Students and scholars examine scanned versions of rare manuscripts held by the Folger and work with teams to decipher and type up in legible text the often difficult handwriting from the time of the Renaissance. The Folger’s holdings include letters, polemics and copies of poetry circulated among friends, and they number in the many thousands. “We don’t know what’s in them yet,” Heather Wolfe, Ph.D., curator of manuscripts and archivist, remarked at one VCU event. The Folger has established the Early Modern Manuscripts Online (EMMO) project to make a variety of rare manuscripts from the Folger Shakespeare Library’s premier collection available to users for free via an easy, searchable website with high-quality images and consistent digital transcriptions of letters, diaries, wills, coats of arms, literary pieces, recipe books, miscellanies and more. At transcribathon sessions, beginners and experts work together, comparing notes and versions of the original handwriting using the EMMO menu of tools available at the website. “What you will do today matters,” Wolfe told everyone at the VCU event, emphasizing the role of collaboration for digital scholarship and the lasting access to crucial knowledge that such efforts achieve for researchers across the world. “The Transcribathon,” said Humanities Collections Librarian Kevin Farley, Ph.D., “aligns perfectly with the advancement of digital scholarship at VCU Libraries – an openness for all who wish to participate in a collaborative learning and creating environment.” VCU participants worked on portions of two manuscripts from the 17th century and encoded them using tags in XML in an easy-to-use interface. Attendance at the VCU events is high. The Folger Shakespeare Library has held several transcribathons, including at the University of Virginia, the University of Michigan and the University of Pennsylvania. The Folger gave high praise for VCU’s good attendance and also for the facilities, the support of the library staff and the excitement of the students. The transcribathons also serve to increase awareness of the Folger Shakespeare Library’s valuable holdings, arguably the best collection of early modern English manuscripts in the United States, Eckhardt said. On Friday afternoon, April 7, Transcribathoners gathered in the lecture hall of Cabell Library. A Transcriba-what? Transcribathons are organized by the Folger Shakespeare Library: Think of it as crowd-sourcing to decipher the handwriting of early modern manuscripts. Co-sponsored with the Folger Shakespeare Library, the VCU Department of English, the VCU Humanities Research Center and VCU Libraries, the Transcribathon provided hands-on digital humanities work—moving forward the Folger project to provide readable transcriptions of rare manuscripts in their collections via an open-access database for global access by researchers and students of this pivotal era in history (http://emmo.folger.edu/). Handwriting from this period followed a variety of forms, including the prominent “Secretary’s Hand,” which may seem to our eyes ornate and often somewhat unreadable. And yet this kind of detective work is extremely popular—especially at VCU, which has the honor of being the only university to host a Transcribathon twice! her photos are available on the library Flickr site. 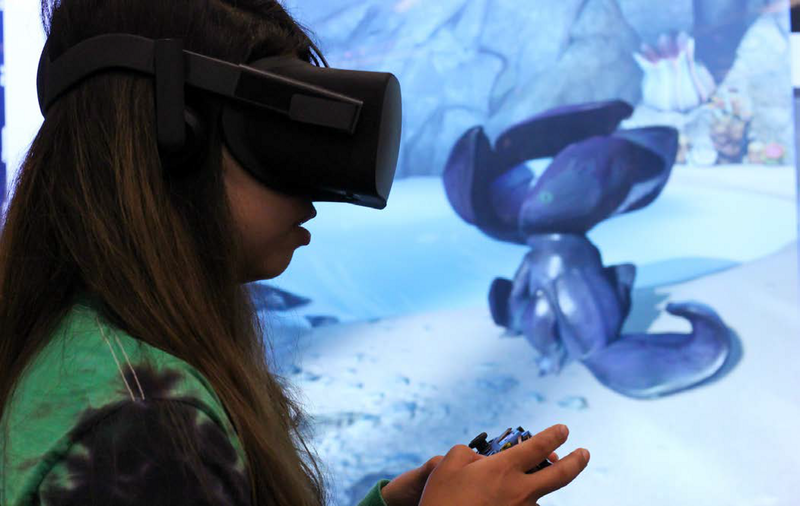 Always working to meet faculty and student needs, VCU Libraries collects video games that have significant artistic and cultural value to meet the growing interest of students and faculty in the fields of animation, multimedia, digital worlds and gaming. The impetus of the collection, which started with 11 games, came from a faculty request to add both board and digital games to support a course. In 2015–16, the libraries began to collect games only available as downloads — important for representation of smaller, independent game developers. “Never Alone” and “Firewatch” are two significant titles. Also new is an “Alienware” gaming PC. This super powerful computer is located in The Workshop. A diverse collection of a dozen games includes “Papers Please” and “That Dragon Cancer.” These works are catalogued and they appear in library records, only for in-house use. This is significant because many libraries avoid downloads, which limits the collection parameters, or they don’t catalog games and instead rely on a finding aid. VCU Libraries catalogers developed creative, flexible workflows to manage these new-age materials. The library’s Innovative Media department provides hardware support for the gaming collection and game developers in a dedicated gaming and group viewing room in The Workshop. Six video game consoles — Sony’s PlayStation 4, PlayStation 3 and PlayStation 2; Microsoft’s Xbox One and Xbox 360 and the Nintendo Wii U — provide users with the means to explore a wide range of game worlds. For computer-based games, the room is equipped with a high-end Alienware Area 51 gaming PC with gaming keyboard and mouse. Games and videos are displayed on a 47-inch, high-definition, 3D-capable LED monitor, and sound is supported by an LG wi-fi streaming sound bar with wireless subwoofer. Users reserve time in the room through an online scheduling system, checkout games and components at the information desk and seek help from knowledgeable staff about hardware, software and game play. The “Collections of Distinction” initiative focuses on expanding and improving collections that provide crucial and unique materials for teaching, research, discovery and enjoyment. Collections of Distinction exemplify VCU’s mission to inspire and foster creative ideas that celebrate diversity, inclusiveness and engagement on campus and beyond. Supporting established or emerging areas of research, Collections of Distinction receive funds to strengthen knowledge in the identified areas — with the goal of elevating them to national and international stature. At the fundamental level, however, they support and foster teaching, research and discovery by VCU’s faculty and students. Want to know more or discuss the Collections of Distinction program at VCU Libraries? Contact Karen Cary, head, Collection Analysis and Investment. Evidence-based quick lessons summarize common conditions, causes and risk factors; contraindications and precautions; assessment and care plans; desired outcomes and outcome measures; best practices and prevention. Evidence-based care sheets detail the best and most current clinical data for specific diseases and conditions. All evidence is evaluated according to a seven-step methodology to ensure the best and most current evidence is presented. Clinical assessment tools are designed for assessing a client through devices used for measuring a given phenomenon (e.g., pain or coping). These can include interviewing, research tools, a questionnaire or a set of guidelines for observation. Social Work Reference Center also provides access to free continuing education modules that offer CE credits online. Each module includes course material, an interactive review and a competency test along with a certificate of successful completion. New VCU users can pre-register online. Social Explorer provides quick and easy access to current and historical demographic data. Easy-to-use online tools help users create custom maps and reports to visualize, explore and understand the patterns behind the numbers. The latest version offers new ways to explore and present data from 1790 to the present, from U.S. neighborhoods to across the globe. Users can access more than 220 years of census data with tens of thousands of maps, hundreds of reports, over 400,000 variables and 40 billion data elements. The core data library includes U.S. Census data from 1790 to 2010 and American Community Survey data from 2005 to 2014. Users can examine this wealth of demographic information at the national, state, county, census tract, metropolitan statistical area (MSA) and block group geographic levels (where available). Specialized U.S. data resources include the FBI Uniform Crime Report data (2010 and 2012), American election results (1912 to 2014), Religious Congregations and Membership Study (1980 to 2010), Vulcan Project carbon emissions data (2002), and County Health Rankings and Roadmaps Program data (2010 to 2016). International data resources include the United Kingdom Census (2011), Canadian Census (2011), Eurostat (1990, 2000, 2010 to 2013), World Development Indicators (2013), and Irish religion and population data (1911 to 2001). Customizable and user-friendly maps, allow unparalleled exploration of demographic data and social change. Users can explore interactive maps with over 200 years of detailed data. See how your neighborhood and country have changed over the decades. Data visualization tools include bubble maps, dot-density maps and bar and color-coded charts. Users can create detailed data reports with the Reporting Tools. Export one or thousands of variables and geographies quickly and easily. Excel, CSV, and other file formatting shortcuts allow you to work with data in a variety of software programs for further analysis. Users are encouraged to create an account so that they are able to save their work and access it for later use. Electronic mapping resources are fast becoming an important tool for researchers to visually communicate their scholarship. More and more VCU research projects require the visualization of data to supplement academic efforts in effective and powerful ways. For example, while you can explain the concept of food deserts, having a way to visually show the large geographic areas that do not have access to a grocery store, paints a much more graphic reality. Or, when a nonprofit needs a list of zip codes that meet a certain criteria for potential donors, looking at that data on an interactive map, enables you to change the data and make adjustments to better focus on exactly the areas you need to cover. Uniworld Online is a searchable database that covers multinational companies with headquarters in over 200 countries and 20,000 industries. It provides contact information for headquarters, subsidiaries, branches and executives of multinational firms. Search by keyword, parent company name, subsidiary name, “division of” name, product description or by descriptive word. It is more comprehensive and more accessible than any other international business contact product. Uniworld Online can be used for business research, career research and is a useful resource for academic career centers. It includes company information and key employees, job hunting information as well as research for those interested in study abroad programs. It also has access to research on careers, employment opportunities, economic research and tracking trends. Both public and private company information is included. It also covers all of the BRIC countries. A Uniworld Online User Guide is available to get familiar with all of the capabilities of the resource. Research global markets with Passport GMID. From Euromonitor, a business intelligence company with more than 40 years of experience analyzing developed and emerging markets, Passport GMID provides in-depth analysis, statistics, surveys, and news for industries, consumer markets, and business environments all over the world. Find company and brand shares of leading companies; use dashboards and data to identify potential markets; and read full text market research reports for over 20 consumer product and services categories. Passport Industrial research examines the industrial makeup of the 68 largest economies in the world. Each economy is broken down into 177 industries, providing cross country comparable data and analysis. Passport Industrial is our first major research effort of B2B markets. Data points include production, profitability, imports, exports, buyers, suppliers, etc. Reports are modeled after Porter’s Five Forces. In the near future, Euromonitor will be expanding its Industrial research to 20 additional countries. The added coverage will be a deeper extension of the current and well-received Markets of the Future (MOTF) reports. The addition of these countries will bring Euromonitor’s premier research coverage to 98% of Global GDP and 91% of Global Population. Passport Cities provides fully comparable data and in-depth analysis on 1,150 of the world’s largest cities. There are detailed reviews of 120 of the world’s major metropolitan areas. Datagraphics, opinion 1 pieces, and dashboards are also prominently featured. MathSciNet, the primary databases for mathematical sciences literature, offers some new features. Search results can now be sorted by publication date, journal title or number of citations. New facets allow users to filter and refine results by item type, author, institution, journal, date and primary classification. The AMS has announced that more upgrades are on their way, including search alerts. When this feature arrives, users will be able to get notifications about author citation counts, new issues and new results to saved searches. Engineering Village now offers a tool to display only those results that contain measurements at a specific value or range in their titles or abstracts. If you’re looking for a measurement in nanometers, the numeric search will automatically convert units and recognize the same values, even if the abstract expresses units in Angstroms, microns, meters, or some other unit of length. For example, if you are interested in high-temperature superconductors, you can specify exactly what temperature to exceed. To use the numeric search, first perform a search in Engineering Village, then open the numeric filter bar on the left-hand side of the results to enter the numbers and units.